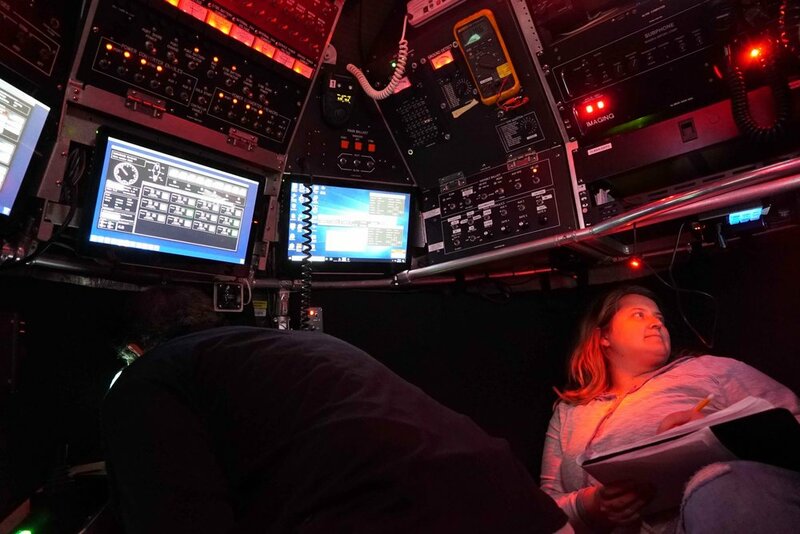 The fourth Deep Sea Exploration to Advance Research on Coral/Canyon/Cold seep Habitats (DEEPSEARCH) cruise occurred over 10 days during October 2018 aboard the R/V Brooks McCall. The chief scientist was Tracy Sutten with the goals to collect water, sediment, and trawling samples; as well as deploy two deep-sea instrumented landers that are currently at the bottom of the Atlantic collecting valuable data for the next year. The Monuments Exploration (MonEx) expedition was a two-week cruise in September 2018 in the Northeast Canyons and Seamounts Marine National Monument aboard the M/V Alucia with the HOV Nadir. 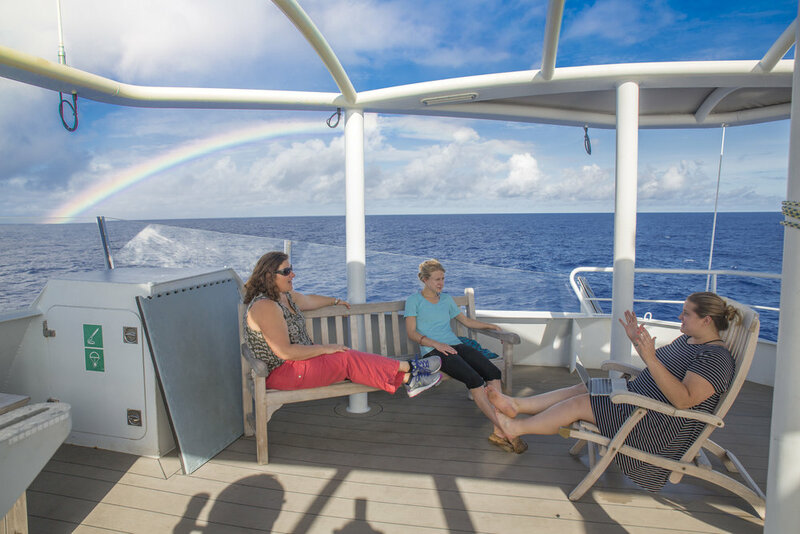 The cruise was led by chief scientist Tim Shank from the Woods Hole Oceanographic Institution (WHOI) with the objective to explore, characterize, and sample coral and associate communities within the national monument. In addition, ocean engineers for WHOI and software engineers from the Jet Propulsion Laboratory (JPL) conducted the first field tests of a new full-ocean depth autonomous underwater vehicle, Orpheus. The third Deep Sea Exploration to Advance Research on Coral/Canyon/Cold seep Habitats (DEEPSEARCH) cruise took place over 2 weeks in August 2018 aboard the R/V Atlantis with HOV ALVIN. The broad goal of this project is to improve the ability to predict the location of seafloor communities off of the coast of the Southeast US that are potentially sensitive to natural and anthropogenic disturbances. This project will focus on various habitats, including cold-water coral mounds, submarine canyons, and methane seeps. This expedition provided samples of corals and associated fauna, community sampling of coral habitats, sediment sampling, collections of corals for live coral experiments, water sampling, and new bathymetry. The Deep Corals of PIPA expedition was a four week trip with Schmidt Ocean Institute aboard the R/V Falkor with ROV SuBastian. This mission provided a first glimpse of many of the habitats that will help determine what Phoenix Islands Protected Area (PIPA) is protecting at these depths, and inform the future management of this area. The Cordes Lab is interested in the diversity and distribution of deep-sea coral species on seamounts in the remote Central Pacific with a focus on the PIPA. We will be conducting a preliminary video assessment of large-scale patterns of coral abundance and diversity across seamounts in PIPA. Additionally, we are interested in cataloguing and preserving deep-sea coral specimens for DNA barcoding to better understand the phylogenetic diversity of corals on seamounts. As many of these seamount ecosystems in this area of the Pacific have never been explored before, we aim to provide an idea of how environmental conditions influence variability of coral community composition. In remote marine protected areas like PIPA, collections of voucher coral species and their symbiotic organisms will help better establish how seamounts in this area fit into a larger biogeography of the Pacific Ocean. The first Restore Deepwater Corals expedition took place aboard the Ocean Project for three weeks during July 2017. This cruise was lead by Dr. Santiago Herrera from Lehigh University with the objective of investigating population connectivity in deepwater corals in the Gulf of Mexico, including species impacted by the 2010 Deepwater Horizon oil spill, and aid in their restoration. We also had the opportunity to collect live Lophelia pertusa colonies to aid in live experiments back in our lab at Temple University. Science team from the first Restore Deepwater Corals cruise including members from Lehigh University, Temple University, Pennsyvania State University, Harvey Mudd College, and NOAA. The final ECOGIG deep-sea coral cruise set sail for two weeks in June of 2017 aboard the Ocean Intervention II with ROV Global Explorer. The science team was lead by Iliana Baums from Penn State University and consisted of members from Temple University and USGS. This expedition provided further monitoring, observing, and collecting of deep-sea coral communities in a continued effort to track the effects of the Deepwater Horizon oil spill. Another set of high resolution images and video were collected in addition to important biological samples. Our team also included members dedicated to public outreach that arranged ship-to-shore sessions with classrooms from around the world as well as an educational video series about the importance of studying deep-sea corals. During September 2016 ECOGIG scientists spent three weeks in the Gulf of Mexico aboard D/S Ocean Inspector with ROV Global Explorer monitoring, observing, and collecting deep-sea coral communities in a continued effort to track the effects of the Deepwater Horizon oil spill. High resolution images and videos were collected to assess the recovery of colonies that have been monitored by scientists at Penn State University since the oil spill in 2010. The primary goals for the Cordes Lab during this expedition were to collect samples of Callogorgia delta to study the effects of natural hydrocarbon seepage on nearby corals and to collect Lophelia pertusa with the intent of live experiments back at Temple University.